Maximum EPA and weight allowances are based on side-mounted luminaires and/or brackets only. 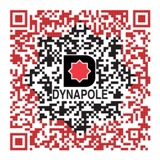 Consult Dynapole for top-mounted luminaire allowances. Includes minimum 2" x 5" hand hole opening.